I am reading some very interesting statistics. 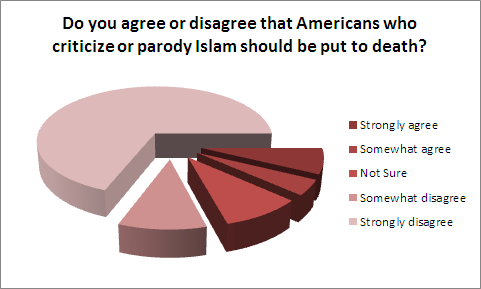 It is a survey of Muslims in the United States. Wenzel strategies is a partisan public opinion firm associated with the US Republican Party. Nonetheless, while their ideology may be reflected in their choice of questions, I have no reason to believe that the statistical integrity of their survey is compromised. There may be some shenanigans not uncommon when partisan pollsters are involved (for instance, how did they select their respondents?) that may skew the results somewhat, but I don’t think they would alter the outcome dramatically. In other words, I don’t think this is islamophobe fodder. The picture painted by the survey is complex. A small but not insignificant percentage of the respondents (almost all of whom are US citizens who are registered to vote) clearly have extremist views: for instance, 12% of the respondents think that those who criticize Islam or Mohammed should be put to death, with a further 9% unsure. On the other hand, defying stereotypes, only about 16% think that Israel has no right to exist, and only 7% think Sharia law should take precedence over the US constitution (with a further 20% unsure). And a surprising 30% think it’s okay for US citizens to evangelize Muslims, with a further 28% unsure. In the data set, I don’t see much by way of significant differences among demographic groups. One exception is the support for the death penalty for those who offend Islam: younger responders were much more inclined to agree (19%) than the older generation. Similarly, younger responders were much less likely to support Israel’s right to exist (31% disagree with that right). Overall, if the survey results are valid, they are troubling. While the majority tends to have moderate views, an alarming minority (and in some cases, even a majority) expressed views that are fundamentally incompatible with liberal Western principles. For instance, as many as 58% do not believe that the First Amendment of the US constitution should protect criticism of Islam or Mohammed. And the fact that younger Muslims tend to have more extremist views may mean nothing (younger people are generally more receptive to radical ideas) but may also indicate an alarming trend. One conspicuously missing demographic question is the one about immigration status: how many of the respondents were born in the US, immigrated as children, or arrived as adults? Perhaps accompanied even by a breakdown by country or region of origin. That is because I would not be surprised at all if the more extremist views were held by recent immigrants from countries with strong tribal traditions. I wonder why these immigration questions were omitted from the survey. Immigration status and partisan views notwithstanding, I find it deeply disturbing that, at least according to this one survey, as many as one in five young American Muslims think I should be put to death if I were to make my critical views on Islam or Mohammed public.